“Mediterranean Hillside,” © 2018 Lynn Abbott Studios. Used with Permission. You are spot on, Lynn! We truly are like sheep, and letting go of the reigns and giving it to the Shepherd seems so hard and so counter intuitive to our human nature! Good word, sister! 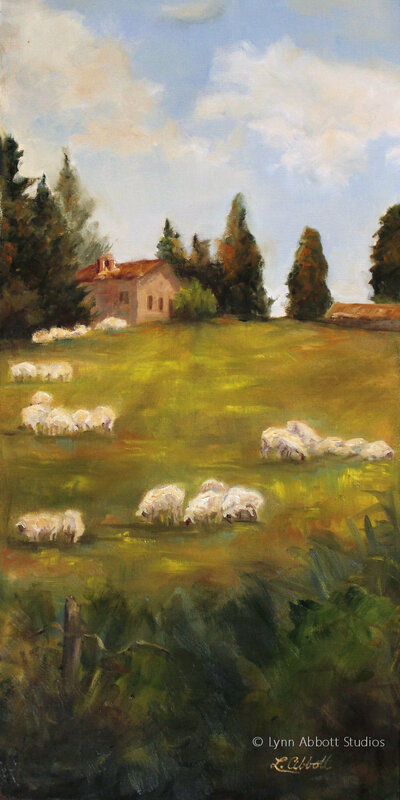 And love your painting….and I bet the shepherd will be round up those groups into one big one soon! Hi Lynn, your statement “It seems that all of my life boils down to this simple choice, one that in my broken humanity I must make again and again.” is in reality, what I also see. Ultimately, He guides us into a deepening level of confidence in Him while at the same time drawing us closer via spiritual awareness of our short comings or circumstances that require more and more reliance. Stretching our faith, so to speak, albeit painfully slow, from our perspective. I think Abraham exemplifies that kind of faith and trust. Almost like bringing us back to Adam and Eve prior to the fall. Key words being “almost like”. I think this is part of the “being made holy” process where our hearts and minds are being changed. Heavy stuff yet simple, which doesn’t really surprise me. Jesus said without Him we could do nothing. Love your posts Lynn, you always make me think. Grace and blessings to you and yours! Who can stand before the Lord? And yet, He bends to us and tenderly cares for us. Exactly. I love the scripture from Job – God is so very worthy of our loyalty. Thinking that His blessings may come if I’m doing well removes grace from the equation. I’m not in this for the blessings, although they are there, I’m in this for the final prize. To please Him and make His name known. I love the song by Mercy Me, “Even If” that encapsulates this thought so well with music – it’s currently on repeat on my playlist. Thank you so much for this beautiful reminder! It truly is freeing to let God be God. The older I get, the more that has become my default. It’s easier to let go than it is to try to steer my own ship. God bless you, Lynn!! Thanks Lynn for this post. It frees me as well when I am reminded that our good God is sovereign. Yet, Life and God seem to be two separate entities and dwelling on myself and my life is not freeing in hard times. You have identified the decision to make in life’s crisis. The longer I live the higher the “trust God” bar seems to be raised. It seems good to God to see how far we will trust Him until we have a common ground with Job, should the bar be raised that high. Thanks again. Yes, indeed… Job raised that bar. I certainly hang on by my fingernails when I experience trials only a fraction of what Job experienced. And the only thing that brings comfort at such moments is knowing that our Sovereign God likens Himself to a loving, compassionate and caring shepherd. I’m just so grateful. Thank you for your honest sharing here, Gary! Your words encourage me more than you can possibly imagine. It is just so great to know that you have walked and experienced a similar path. God bless you greatly, my wonderful friend! Praise the Lord for guiding us in a way no other shepherd would!!! I love the sternness God gives Job. I feel God can be a whisper or a roar like a lion. He reminds Job how He created everything and Job has no way to do those same things. What a humbling statement! It also convicts me to trust in His plan and power that is so above what I know! Once again, fantastic paintings! Looking at the one with the sheep, reminds me of my friend’s farm in Tuscany! Awesome work girl, take a bow! As to the lesson … well… it seems that Job has been our family book for years now. But for every problem and struggle, it’s drawn us one inch closer to seeing Papà for Who He IS. And each inch closer ‘confirms’ His Awesome Love for us. Great post, Lynn. Your conclusion … letting God be God … is the best advice of all, and the best tonic during the darkest and most painful times of life. Letting God be God removes the onus from us, takes away all (or most) questioning and doubt, and allows us to rest in the bosom of our sovereign-shepherd. Thanks I can use all the hugs I can get. “In fact, it frees me”. Thank you for expressing my heart as well. During the worst time of my life I was determined to seek and accept the sovereignty of God. This truth more than anything rooted my faith deeper. Wonderful artwork, uplifting scripture – thank you so much! Yes, we are the sheep of his pasture, we can take comfort in that. Life is difficult to understand down here in the valley. The good die young and the evil live on, there is not explanation. But some day, we will understand. Good Post!!! Nice artwork Lynn. Love that sky. Easy to get inspired by sights of that. Thank you with all my heart, CS!! I’m truly honored by your kind words since you regularly encourage and inspire me!! God bless you big time! I had just finished asking the Lord some questions, some of which he answered, but some of which he did not, not yet anyway. And, my questions definitely were related to ‘full disclosure,’ so when I read this I knew the Lord was speaking to me. Will I trust him even though there are things hidden that I don’t know about and that I don’t understand? Will I trust him even if I don’t know what is going on and even if he chooses not to show me? At least, not now, perhaps? Dearest Sue… you can’t even begin to comprehend how much your comment has meant to me. Sometimes, I am overwhelmed by the blog. As you know, I work full-time as an artist. That is actually more than full-time work. And I also take ongoing courses in my field. With all of that, I have often questioned whether or not I should continue to blog since it is at least a part-time commitment in and of itself. Yet, it seems one way I can use my art directly for Christ… and so I have plodded on to the best of my ability. To know that a post has been used by God to touch a friend whom I truly admire for the depth of her wisdom and faith is a gift beyond all that I could hope for! Thank you; thank you with all my heart for your encouraging and honest words here! You have blessed me more than you can ever imagine!!!! I treasure your friendship! God bless you, dear sister and wonderful friend!!!! ❤ ❤ and hugs!! Dearest Sue, you are such a blessing to me! Yes, I will continue to write as long as God wishes me to do so… and He hasn’t released me to quit writing so I suspect I will be writing for a long time! 🙂 And you, dear friend, minister to me through your beautiful blog as well! I’m so thankful that God allowed us to meet through the internet and through the blogging community! Love you right back!! Huge hugs!! Ditto on the being thankful that God brought us to the same place at the same time so that we could meet, and so that we could encourage one another in Jesus. This is wonderful, Lynn! I completely agree – when I stop trying to seize the reins, I have much more peace. And He truly is the Good Shepherd – remembering that frees me to just do what I am supposed to do – namely walk in obedience and praise Him. 🙂 An excellent word for us to remember today! Thank you for these words of encouragement this morning, Lynn. Well, they were already here, but I am reading them this morning. It is wonderful to let God be God. A pity that it takes us so long to learn this lesson! By the way, Abba gave me the job I wanted, doing proofing and clerical work, part-time. It was all Him because in the interview they told me they were only looking for full-time applicants. I’m going to miss the cardinals, geckos, and squirrels in my backyard, but I shall enjoy being a part of the college staff. I start in 2 weeks! Oh, how wonderful! I visited Pensacola once! It’s beautiful! You live in such a lovely place! Is your husband military? I recall you lived in the Virginia Beach area…and I know there is a Naval base/place in Pensacola as well. Just wondering. 🙂 ❤ and huge hugs, dear Angela! Love you too, Lynn! And yes, it is nice to be near them. In fact, I drove out to Jacksonville twice in the last week—for my mom’s birthday, and for the funeral of her best friend. Lynn, what a great reminder that God is God and we are not. When my first relationship tuned out to be like an eternal 10 years, and when my cancer went from stage II to stage IV in three months, I visualize God’s conversation with the greatest enemy of all and could hear them talking about me. I’m thankful for God’s strength and power to sustain me, assures me that He has a great plan for me. It turned out that He was right. Of course, He was. I’m so blessed to have gone through what He had for me. He is my Shephard and my King. What a powerful and beautiful testimony to God’s grace and faithfulness you have shared here, dear Miriam! You inspire and encourage me with you faith more than you can imagine! God bless you greatly, sweet friend! ❤ and hugs!! What I liked about the quote was that I feel that happens to a lot of Christians today. When trials come, out faith is tested. When tragedy strikes out life, we do ask ourselves this questions because we all have these moments of doubt towards who God is. 3). “If, however, I understand and truly believe that the Shepherd is loving, tender, compassionate, good, perfect, all-knowing, all-powerful, ever present, then the decision to accept His sovereignty is not complicated. Hello, Joshua! As always, it is such an honor to have you read my post and to share your truly wise reflections! God has truly gifted you with discernment! May He continue to greatly bless you in all that you do! This was put together with sensitivity and care; not a topic that evokes such peace, but you managed that amazingly. Reminds me of the Grace of God all the way = soothing oil flowing down wounds and scars. So glad I got to read this. Even the art, its very stilling, like a touch from Jesus. God bless you. I’m with you Lynn, I would rather let GOD be GOD and I am ok with not knowing it all and I just trust HIM for who HE is. The word tells us over and over about HIS love for HIS creation. How can we not understand that alone? I keep my eyes and thoughts vertical these days!! As you shared Lyn; Jesus our Good Shepherd cares for us and He also brings the lost Sheep home to safe Pasture and yes I was one of them, having been deceived as a young Teenager that I came from an Ape and that Jesus my Best Friend was just made up and the Bible too. I have always felt Compassion Lynn for both Job and his Wife, Satan did indeed put them through his fire to test them and yes he does this with us too having the right to do so because of the fall but as it was with Job he cannot kill us. But yes he has sure tried with me although even as a Atheist for almost 30 years at least in my my understanding, God saved my life at least 3 times that I know of and more times when I became a Christian. But as I was thinking of Job’s wife it impacted me; how would I respond if like her I lost my all my Loved Children and my home and than watched my Husband picking his sores in the gutter and being put down by his friends. She responded to her intense pain in a fleshy way but Job reminded her that she needed to Trust in God. But later Job also said sorry to God for doubting His Goodness when God showed him that all good things came from Him and not bad and than He gave Job and his wife much more than they had lost. We know God is Love Lynn and that all good things come from Him because unlike the old Testament Saints we have the reality they only had the promise. Pentecost has now come and we have the empowering of The Holy Spirit and having asked for God’s Wisdom too, we don’t doubt His Goodness to us or to all those whom He knows as His own too. Christian Love Always dear Lynn and God’s Blessings – Anne. I have felt the same for Job and his wife, dear Anne. In fact, I recently reread the book of Job and as I did, I wept for them. How difficult it must have been because of course, they did not have the fullness of Scripture in its entirety as we do. When I think of that, I am all the more amazed by their faith although it was obviously imperfect. Our enemy is great, but I am thankful that God is so much greater. And I find comfort in that as it is so clearly demonstrated in the book of Job. Thank you so much, dear Anne, for your thoughts as they have sharpened my understanding of this magnificent book of the Bible! You are such a blessing! Love and hugs!